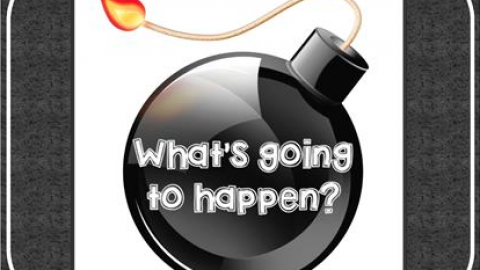 European Union Growth Lowered, S&P 500 Earnings Growth Lowered: Pause? 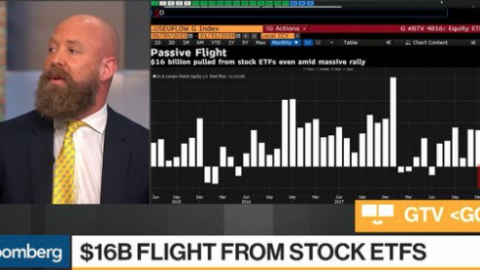 In other headlines, J.P. Morgan Chase believes we’ve entered a new risk-on environment for equities. The bank’s global strategists continue to favor equities relative to bonds, saying in a monthly report that markets are still some way off from fully pricing in less tightening from the Fed. With valuations more supportive, they scrapped hedges that helped cushion performance going into December. They lifted allocations to emerging-market stocks and bonds. 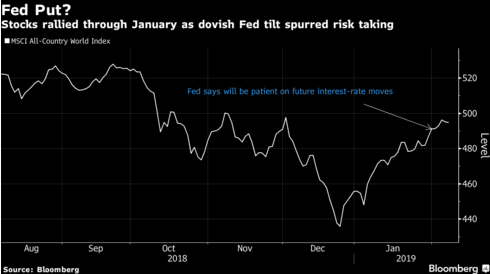 “This decisive dovish shift, to the extent it is sustained, is removing some of the headwinds that caused the 2018 market rout and raises the prospect of 2019 being an asset-reflation year,” JPMorgan strategists led by London-based Nikolaos Panigirtzoglou wrote in the Feb. 6 note. Or course, this go-forward strategy and recommendation from J.P. Morgan Chase came ahead of the European Union lower its outlook for 2019 GDP. Nonetheless, the bank goes on to suggest that U.S./China trade resolution couple with China’s stimulus packages should improve the outlook in favor of risk. U.S. equity futures are largely lower in the pre-market hours on the heels of global growth concerns expressed by the European Commission. As we mentioned in our State of the Market video on Wednesday, we had concerns over the latest economic data coming from Germany, the largest economy within the European Union. Little did we know that our considerations would result in action. One of the issues we’ve been following in Germany is the slowd recently in its manufacturing data segment. 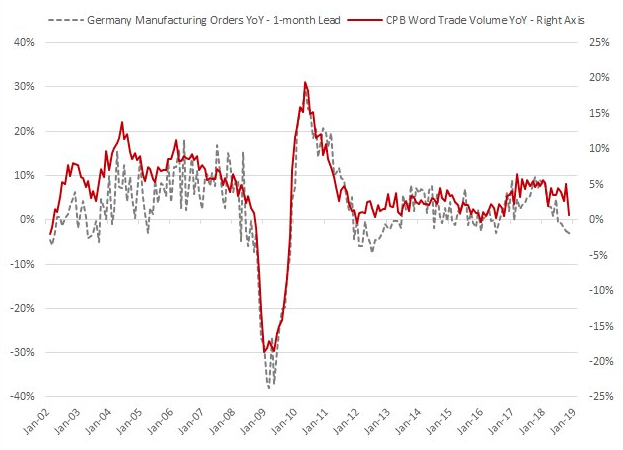 German manufacturing orders confirm that global trade growth could contract soon on a YoY basis. The European Commission, the EU’s executive arm, revised down its growth forecasts for Germany on Thursday. It’s now expected to grow by 1.1% this year, from a previous forecast of 1.8 percent. The Commission also lowered its prospects for the Euro area as a whole. The region is now set to grow 1.3% this year, from a previous forecast of 1.9 percent. “In the case of Germany we see that there are certainly some short-term factors in play,” Valdis Dombrovskis, vice president of the Commission, told CNBC’s Willem Marx in Brussels. “If we discuss global trade tensions, if we discuss the slowdown in emerging economies including China, it’s going to affect the economies of countries which are relying on exports to a large extent, and Germany is by far the EU’s largest exporting economy,” he said. “So, if there are tensions and uncertainty around trade, of course it’s going to affect the exports and it’s going to affect the economic growth (of Germany), so this is something that we need to watch very closely,” he added. 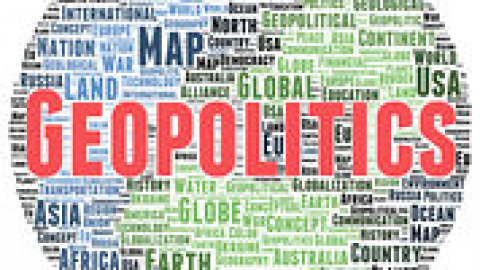 With 2019 European growth expectations curtailed once again, the USTR is scheduled to put forth its analysis and recommendation for U.S./E.U. auto trade next week. 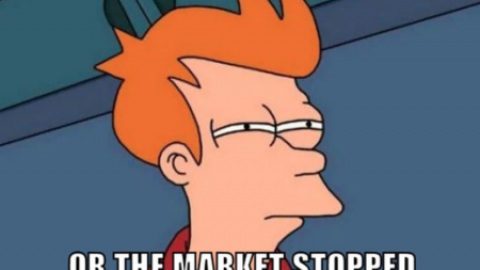 Given the timing of this event, we would be of the opinion that the European markets may come under pressure when headlines break on the subject matter. President Donald Trump has threatened tariffs on European auto imports in the past. To be clear, the USTR is only scheduled to issue recommendations which are likely the opening salvo to negotiations between the two regions. Nonetheless, the known threat has already served to curtail economic growth in Germany, which achieves much of its GDP output from the auto sector. 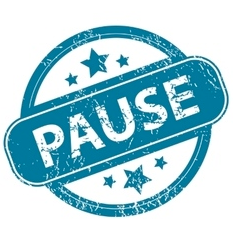 Here in the U.S. we’ve been plodding through a week that is heavy with Fed speeches, including last nights speech from FOMC Chairman Jerome Powell at a town hall meeting in Washington D.C. and before a group of educators. Sluggish productivity and widening wealth gap are the biggest challenges facing the U.S. over the next decade, Federal Reserve Chairman Jerome Powell said Wednesday. The central bank leader said his greatest economic fears lie outside the Fed’s purview. Specifically, he called for more aggressive policies to address income inequality. Wages at the middle and lower levels have “grown much more slowly” than those at the higher end, he said. As we roll through the early morning hours, unfortunately the outlook for equities is deteriorating with the U.S. equity futures following the European major indices lower. The German Dax is off by greater than 1% in the 6:00 a.m. EST hour, which is finding Dow Futures lower by nearly 175 points. We’ll have to see how things shake-out for the U.S. come the opening of trade, but after the major averages have expressed overbought conditions, it would come as no surprise if investors mirrored the Fed’s decision to “pause” and possibly even pullback near-term. We’ve been highlighting overbought conditions in the S&P 500 since our most recent Weekly Research Report. Why? Well because we know that just like markets can’t stay oversold for too long, they also don’t stay overbought for very long either. 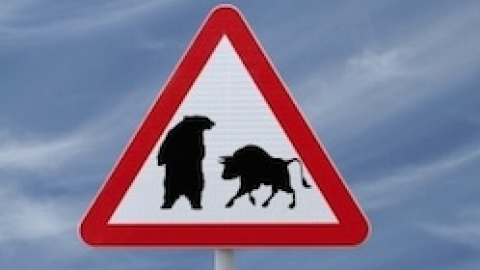 In short, while J.P. Morgan has issued a risk-on sentiment and we believe that 2019 will largely favor equities when compared to 2018, there’s no need for traders/investors to chase a 16% S&P 500 rally. 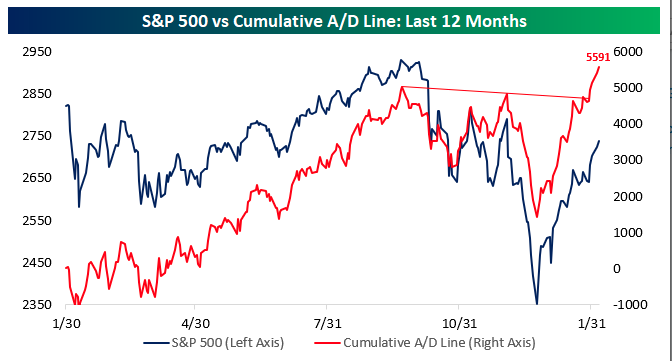 With more than 50% of S&P 500 stocks now above their 50-DMA, we’ve also seen the A/D line rising. As the S&P 500 has broken through resistance around the 2,630 level, cumulative breadth has really taken off and broken free from its prior high. Strong breadth indicates broad participation, and that’s exactly what we have seen so far this year as small caps have led the gains, and even the S&P 500 equal-weight index is outperforming the cap-weighted index by over 2% YTD. 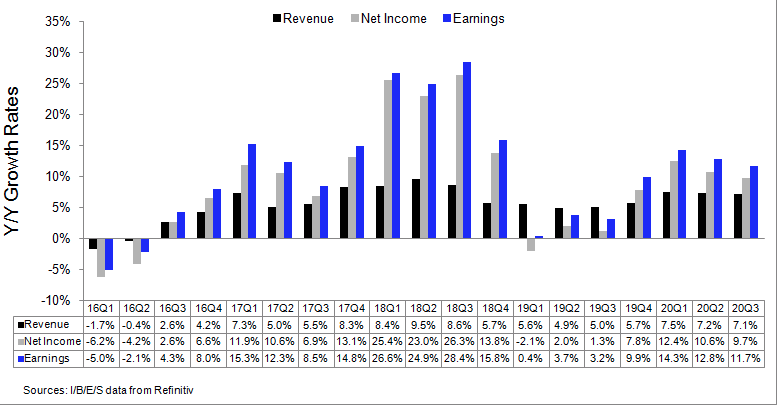 As we carry through the week and earnings season, the earnings picture continues to find Q1 EPS expectations and forecasts under pressure. 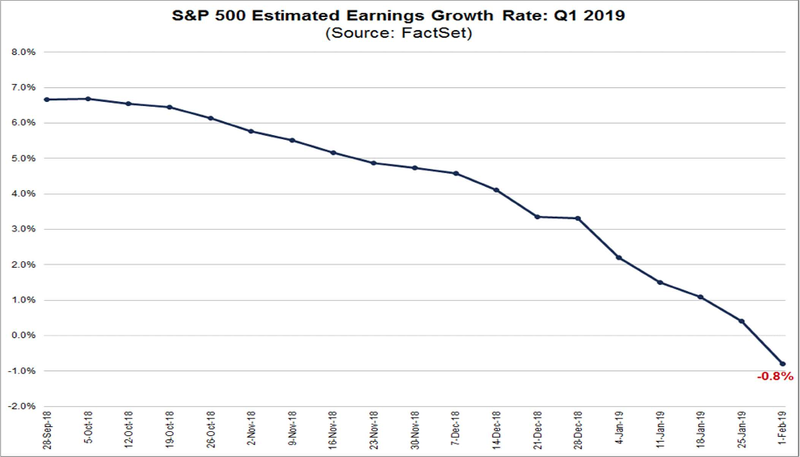 FactSet data suggests that earnings will decline by .8% in Q1, as depicted in the chart below. The economic data calendar is light for the remainder of the trading week, with only Initial Jobless Claims and Consumer Credit slated for release Thursday. Fed speeches carry through today from James Bullard and Vice Chairman Richard Clarida. The big earnings release of the day will come from Twitter (TWTR). 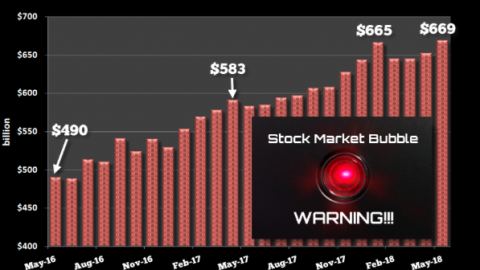 With Facebook (FB) and Snap (SNAP) already having reported and finding significant share price appreciation upon releasing quarterly results, it remains to be seen if TWTR shares can follow suit for the trifecta of social media stocks. 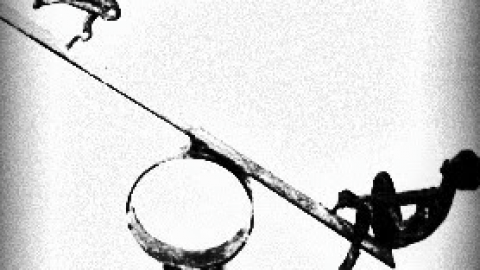 U.S. equity markets have climbed steadily through the New Year and broken above critical technical levels. We could see the S&P continue to trend higher or take step back. A pullback would be healthy. with that in mind, please click on the Daily, Technical Market Recap video link to review. 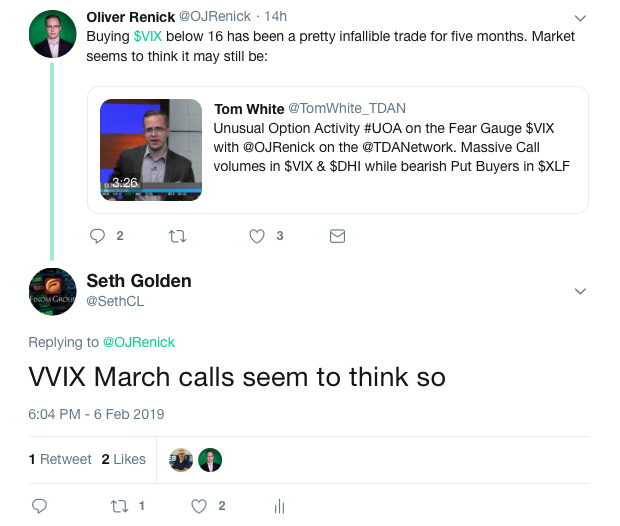 Within the Technical Market Recap Wayne discusses what we saw recently in the VIX call options volume. Something Seth also denoted in a tweet as follows.